People have made a lot of the weapons from Overwatch. From Tracer’s Pulse Pistols to Zarya’s Particle Cannon. But few have accurately made Mei’s Endothermic Blaster until now. 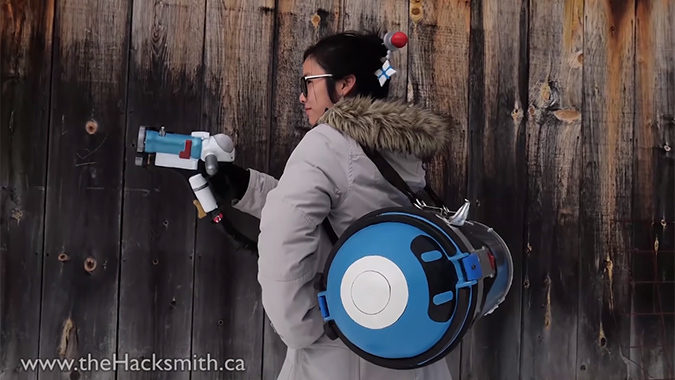 The team at Hacksmith — a group of makers that have made several Overwatch weapons before — have created a working version of Mei’s snow-spewing weapon. In the game, it freezes enemies in place and sets them up for allies to attack them. It recently got a buff too! Hacksmith’s physical version uses dry ice inside of a fire extinguisher and covers it the blue and white outer sections that you see in the game and Mei’s animated short Rise and Shine. The team shows the entire process of creating the gun. It’s a lot of planning, tweaking, and testing it out. While they don’t show exact instructions, the ideas are there. It’s good inspiration for someone looking to make it themselves or for someone who simply wants to see what the process is like. Unsurprisingly, a lot of the work goes into making Mei’s gun and backpack-like container (with Snowball) look accurate. There’s several scenes where they’re shaping the outside parts and painting them to look accurate. The gun itself is pretty simplistic — they added a nice laser sight onto it for aiming. The challenges came from the way the dry ice is connected to it. There’s a point in the video where they think it’s pretty ready but a tube rips apart and they have to go back and make sure all of the connections are tight. Eventually they get it all working and do a bunch of tests, including trying to freeze a cup of water. The whole setup looks like it would make a great cosplay addition but I’m sure you would not be allowed to actually fire the weapon in any convention center.